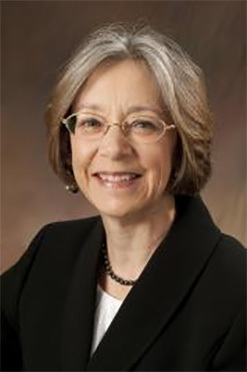 Wabash College President Gregory Hess announced that Chief Judge Diane P. Wood, United States Court of Appeals for the Seventh Circuit, is the 2017 recipient of the David W. Peck Senior Medal for Eminence in the Law. Wood will be on campus to deliver a lecture – “Public Service and Private Initiative: An American Tradition” – at 5 p.m. on Monday, April 24, in Baxter Hall room 101, and will receive the Senior Peck Medal thereafter at the 44th Annual Peck Dinner. A graduate of the University of Texas (B.A. 1971/J.D. 1975), she began her legal career clerking for Judge Irving L. Goldberg of the Fifth Circuit and for Justice Harry Blackmun, making her one of the first female law clerks on the U.S. Supreme Court. She worked briefly at the U.S. State Department, focusing on international investment, antitrust, and transfer of technology issues, before going into private practice. In 1980-81, Wood taught at the Georgetown University Law Center before joining the faculty at the University of Chicago Law School in 1981, serving as associate dean from 1989-92. Prior to becoming a judge of the U.S. Court of Appeals for the Seventh Circuit in 1995, Judge Wood was the Harold J. and Marion F. Green Professor of International Legal Studies. Wabash alumnus John Collett ’24 established the Peck Medal to honor his fraternity brother Judge David W. Peck ’22, who practiced law for many years at Sullivan & Cromwell in New York City and also served as presiding justice of the courts in Manhattan and the Bronx. For over four decades, the Peck Dinner has provided a unique opportunity for Wabash students interested in the law to meet lawyer alumni and to benefit from the wisdom of the Senior Peck Medal recipient. The event also recognizes student Prelaw award winners. 1980 Paul H. Buchanan, Jr.
2006 John T. Noonan, Jr.